The Kickapoo Department of Environmental Programs is responsible for solid waste identification and the remediation of illegal dump sites. To be eligible for federal funding, open dump sites must be listed on the Indian Health Service (IHS) Sanitation Deficiency System (SDS). Most sites are located on tribal trust land or allotted land and have SDS and Facilities Data System number (FDS). Federal dollars from the Environmental Protection Agency (EPA) are limited to complete closures each year. Now, there is restricted funding to tribes. These dump sites are surveyed annually by Kickapoo Department of Environmental Programs staff and IHS representatives, and are coded into the Sanitation Tracking and Reporting System. Open dump sites are not only eyesores, but also pose threats to human health and the environment, particularly with abandoned groundwater wells near ceremonial grounds. 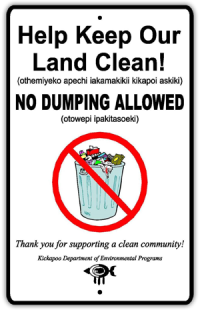 Because the dumpsites are listed in the SDS and are located on tribal trust land, these dumps could potentially affect the lives of many tribal members. Recent Project is OK 10-Q85 Summary. A memorandum of agreement between the Kickapoo Tribe of Oklahoma and the Indian Health Service was finalized on 9 March 2011 to cleanup six dumpsites. Federal funds were merged together between the Bureau of Indian Affairs, Indian Health Service and the Environmental Protection Agency for the Kickapoo Tribe of Oklahoma, through the Tribal Solid Waste Interagency Workgroup grant. Solid waste dumpsites are listed below as number one through eight; location names are included for reference. The original project included site names of North Tribal Trust, Sanders, Whitewater, North Canadian River, Trevino and Starr. However, Starr site was previously cleaned up by EPA grant funds in September 2010. As a result, we were able to clean up two additional dumpsites on the Indian Health Service Sanitation Deficiency System (SDS) list. The Kickapoo Department of Environmental Programs was the principal project leader. Initial startup was funded by the B.I.A. to help coordinate project documentation and grant administration. All EPA funds were transferred to I.H.S. to develop a MOA with the Tribe; therefore, an I.H.S. project summary was developed in January 2011, following a signed MOA. In May 2011, I.H.S. provided NEPA clearance to proceed with clean-up activities. A table has been inserted to show dumpsite cost. Photographs of each dumpsite are in the media gallery illustrating before and after conditions at each site. Richard Ketakeah, Kickapoo Environmental Technician, and Robin Mack, Kickapoo Tribal Maintenance Department, have provided most of the manual labor at these clean-up sites. The program secured roll-off dumpsters and mini-excavation equipment to manage the disposal of the solid waste. In addition, gates and fences were installed to prevent re-occurrence, and bilingual signs discouraging dumping were installed. Much of the debris was categorized as residential waste combined with construction waste. It was encouraging that most property owners were willing to hire a private solid waste company for residential waste pickup, indicating community support of and commitment to project outcomes. Recommendation: The Kickapoo Environmental Department has completed all tasks in this project. However, it is important to note additional sites on the SDS list will necessitate further funding for clean-up and closure. Although this project has been a success, open dumpsites remain a problem within the jurisdiction. Future clean ups could be addressed most efficiently and cost-effectively if the Tribe owned skid-steer equipment and a trailer. As a result, a request for funding to purchase these pieces of equipment will be included in future proposals. Please complete our department request forms to initiate a solid waste survey. Staff members will schedule an appointment with you. Community clean-ups are schedule in Spring. However, the tribal maintenance department in conjunction with our efforts have been providing roll offs at the secondary complex for those wishing to remove large unwanted items. Please don’t dispose the following items in roll offs: TIRES, BATTERIES, PAINT CYLINDERS, APPLIANCES WITH FREON AND MEDICAL WASTE. We also recycle automobile tires without rims with the State of Oklahoma Department of Environmental Quality but they must not be large off-road tires, and equipment tires such as forklift and backhoe tires. If you are disabled and required special assistance, please contact the Maintenance Department at 405.964.7657 for arrangements.